By the age of sixteen, one in five children will sustain a mild traumatic brain injury also known as concussion. Our research found that one in seven school children with mild traumatic brain injury suffer post-concussion syndrome symptoms for three months or longer. Post-concussion syndrome is associated with significant disability in the child and his/her family and yet there are no evidence-based medical treatments available. Melatonin has several potential mechanisms of action that could be useful following mild traumatic brain injury, including neuroprotective effects. The aim of this study is to determine if treatment with melatonin improves post-concussion syndrome in youths following mild traumatic brain injury. Our hypothesis is that treatment of post-concussion syndrome following mild traumatic brain injury with 3 or 10 mg of sublingual melatonin for 28 days will result in a decrease in post-concussion syndrome symptoms compared with placebo. Ninety-nine youths with mild traumatic brain injury, aged between 13 and 18 years, who are symptomatic at 30 days post-injury will be recruited. This study will be conducted as a randomized, double blind, placebo-controlled superiority trial of melatonin. Three parallel treatment groups will be examined with a 1:1:1 allocation: sublingual melatonin 3 mg, sublingual melatonin 10 mg, and sublingual placebo. Participants will receive treatment for 28 days. The primary outcome is a change on the Post-Concussion Symptom Inventory (Parent and Youth). The secondary outcomes will include neurobehavioral function, health-related quality of life and sleep. Neurophysiological and structural markers of change, using magnetic resonance imaging techniques and transcranial magnetic stimulation, will also be investigated. Melatonin is a safe and well-tolerated agent that has many biological properties that may be useful following a traumatic brain injury. This study will determine whether it is a useful treatment for children with post-concussion syndrome. Recruitment commenced on 4 December 2014. This trial was registered on 6 June 2013 at ClinicalTrials.gov. Registration number: NCT01874847. Traumatic brain injury (TBI) is one of the most common causes of neurological morbidity and it is more common in childhood and adolescence than at any other time of life [1–4]. Mild traumatic brain injury (mTBI) is the acute neurophysiological effect of blunt impact or other mechanical energy applied to the head, such as from sudden acceleration, deceleration or rotational forces [5, 6]. It accounts for 90% of all TBIs . Epidemiological studies suggest that one in five children will experience a mTBI by the age of 10, [1, 8] and 799 out of 100,000 children under 14 years visit the emergency department (ED) with a mTBI in the United States  and Canada . Falls (51%) and sports-related activities (25%) are the commonest causes [2, 10, 11]. One in seven school children sustaining an mTBI will suffer post-concussion syndrome (PCS) symptoms for three months or longer . PCS is a combination of clinical symptoms including physical (such as headaches), cognitive (such as learning and/or memory dysfunction), and behavioral (such as mood) disturbances [7, 10, 12]. It is associated with significant disability in the child and his/her family [5, 12–17]. It has been shown that 2% of mTBI children continue to have PCS symptoms one year later . Using these figures, we estimate that annually over a 1000 children in Canada have PCS for over a year due to a ‘mild’ TBI and yet there are no evidence-based medical treatments available . This suggests an urgent need to develop novel treatment options to improve outcomes for children suffering from PCS . Furthermore, our neurobiological understanding of PCS is lacking [6, 18], and routine clinical tests are not informative and so are not helpful in guiding treatment. The complex pathophysiology of mTBI is well described [19–26], but the explanations for prolonged PCS are unclear [21, 27]. The mechanisms leading to neuronal dysfunction, cell death and altered connectivity include: oxidative stress, metabolic dysfunction, neuroinflammation, axonal damage and alterations in cerebral blood flow [19, 21, 28]. Most animal studies demonstrate recovery from mTBI within 7 to 15 days [22, 29, 30], similar to the clinical experience of the majority of humans [6, 10, 12]. However, the pathophysiological explanations for prolonged PCS, seen in 11% of children with mTBI, have been elusive [10, 27]. Recent animal and human research suggest that the explanations for the persistent PCS symptoms may be due to alterations in neuronal circuitry and neurotransmission [29–36]. There are few evidence-based treatments for PCS and these studies usually do not include children, and so pediatricians have to rely on consensus guidelines for adults [37–44]. Avoidance of repeat injury is the mainstay in any treatment regimen for TBI as is rest until symptoms resolve [18, 45]. As PCS symptoms resolve quickly in the majority of people, clinicians do not use pharmacological treatments (except for analgesics) in the first few weeks after injury [38, 46–50]. There are few evidence-based treatments for PCS that persists for one month or more [37, 40, 43, 44, 51–53], providing the clinician with little guidance for the management of significantly debilitated patients . Treatments are used without conclusive evidence  and are chosen to target the most problematic symptom [49, 54–60]. A frequently recommended treatment for sleep dysfunction after mTBI is melatonin . Melatonin, naturally produced in the body by the pineal gland, has neuroprotective, analgesic, and anxiolytic properties and is a promising agent in TBI [62–67]. Melatonin’s role in the chronological regulation of major physiological processes (such as the sleep/wake cycle) [68–70] is well accepted. More recently, its therapeutic potential is being explored in other neurobehavioral conditions (for example chronic pain, headaches and anxiety) and TBI [67, 71, 72]. The many separate biological activities of melatonin are both receptor-mediated (at physiological levels) and non-receptor mediated (especially at supraphysiological levels) [63, 72]. It is lipophilic, can cross cell membranes easily [73, 74] and its neuroprotective mechanisms include i) reducing oxidative stress (for example decreasing oxidative and nitrosative abuse, lipid peroxidation, and increasing antioxidant enzymes) [75–81], ii) improving mitochondrial function [62, 73, 74, 82, 83], iii) inhibiting apoptosis (cell death) [84–86], iv) decreasing the neuroinflammation [64, 87, 88], and v) decreasing glutamate toxicity via GABA receptors [89–91]. The inherent biochemical and physiological characteristics of the brain, including high polyunsaturated fatty acids and energy requirements, make it particularly susceptible to free radicals mediated insult. Melatonin has been shown to decrease oxidative stress induced by exercise in young athletes [92, 93] and in patients with renal failure . It protects against focal and global brain injury in adult and juvenile TBI [87, 95–97], ischemic brain injury [98, 99], cerebral edema [67, 100], spinal cord injury [101, 102] and radiation injury . Further, melatonin improves many of the symptoms seen in PCS such as headaches, pain, and anxiety  probably via the gamma Aminobuteric acid (GABA)-ergic system and opiate receptors [66, 105–107]. It is used to aid sleep in children with disabilities and visual impairment . Melatonin has analgesic properties and has been shown to be useful in adult and pediatric migraine [109, 110] and disorders of chronic pain (such as fibromyalgia and irritable bowel syndrome) [111, 112]. It is also effective in treating anxiety. In a systematic review, premedication with melatonin significantly decreased preoperative anxiety . The dose of melatonin in clinical pediatric practice ranges between 1 and 10 mg. Receptor-mediated effects occur at physiological doses (for example in children with chronic insomnia effects are achieved at 0.05 to 0.15 mg/kg) . Lower doses do not achieve the same analgesic and anxiolytic effects [109, 111, 115–118]. In order to saturate melatonin receptors and achieve non-receptor mediated effects, supra-physiological doses are required [114, 119, 120]. A dose of 10 mg melatonin is likely to achieve this and yet stay within clinically-accepted parameters . We found that children with prolonged PCS and headaches had a significant response to melatonin treatment [61, 121]. Post-traumatic headaches (PTH) are thought to be particularly resistant to treatment [55, 122, 123]. Few studies have specifically analyzed how patients respond to treatment [124, 125], and none of these were in children. Our study aimed to: 1) describe the headache characteristics of PCS in children and 2) their response to pharmacological treatments . A retrospective chart review of 48 children treated for PTH since 2007 was performed. The mean age was 14.1 years (SD 3.1) and 66% were female. The time since injury was 10.6 (SD 8.1) months. Melatonin was used as a first-line treatment where sleep dysfunction was a comorbidity. A total of 15 out of 18 children responded to melatonin treatment. Seven children were treated with 3 to 5 mg of sublingual melatonin; 11 children were treated with 6 to 10 mg. 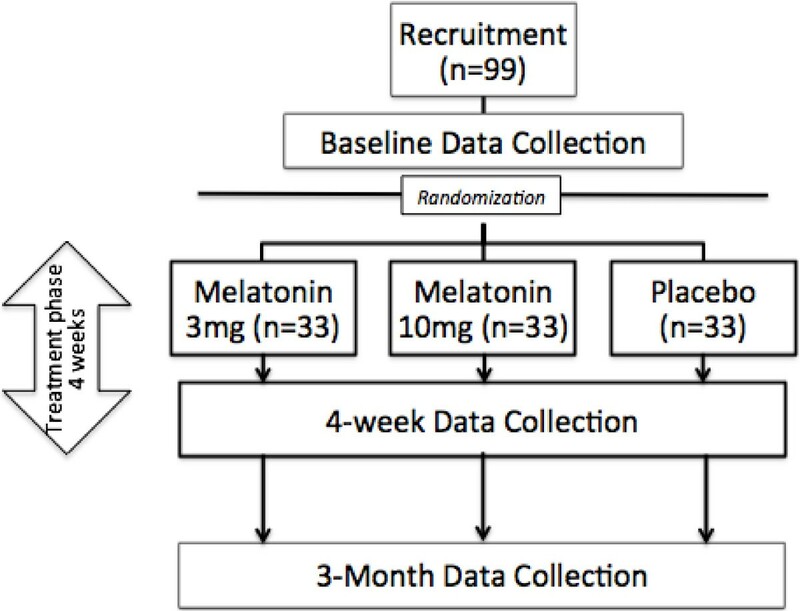 Significantly more children responded to treatment with melatonin (83%) when compared with the other treatments used (P <0.05) and no serious side effects were reported. As these children were on average 10.2 months post-injury, it is very unlikely that this response was due to time alone. In summary, melatonin has potential as a safe therapeutic candidate for the treatment of PCS in children. It has efficacy in many of symptoms commonly encountered in PCS. In preliminary work, we found that children with prolonged PCS and headaches had a significant response to sublingual melatonin treatment . Melatonin’s therapeutic potentials in mTBI include: 1) as a free radical scavenger and broad-spectrum antioxidant [75, 76, 82, 88, 126] and 2) symptomatically via the GABAergic system and opiate receptors [66, 95, 105, 106, 127]. The aim of this trial is to determine if treatment with melatonin improves PCS following mTBI in youths. We hypothesize that the treatment of children with PCS following mTBI with 3 or 10 mg of melatonin for 28 days will result in a decrease in PCS symptoms as compared with a placebo. The primary research question will be: Does the treatment of children with PCS symptoms following mTBI with 3 or 10 mg of sublingual melatonin for 28 days result in a decrease in PCS (physical, cognitive and behavioral) symptoms as compared with a placebo? The secondary research questions will be: 1) Is there a dose-response relationship? and 2) Is the treatment effect independent of the effect on sleep? This study will be conducted as a randomized, double blind, placebo-controlled superiority trial. Three parallel treatment groups will be examined with a 1:1:1 allocation: 1) sublingual placebo, 2) sublingual melatonin 3 mg, and 3) sublingual melatonin 10 mg, see Figure 1. Individuals will be allocated to treatment groups using a randomization sequence that will be created in variable random block sizes (multiples of 3: 3, 6 and 9) to aid in the concealment of the next allocation, using random number-generating software. Participants, parents and investigators will be blinded to treatment groups. The primary endpoint is the change on the Post-Concussion Symptom Inventory Score for the parent (PCSI-P) and youth (PCSI-Y). Secondary outcome measures are listed in Table 1. The design allows for dose-dependent response assessment. This study was approved by Health Canada (clinical trial application number: 16391). Ethical permission was granted by the University of Calgary Health Research Ethics Board (number: 13-0372); protocol amendment version 02: 24 March 2014. Trial metadata are given in Addition file 1. Study flow diagram. The study will recruit 99 participants from Alberta Children’s Hospital Emergency Department and surrounding sports medicine and pediatric centers. Participants are randomized after baseline data collection to melatonin 3 mg, melatonin 10 mg, or placebo in a 1:1:1 ratio. There is a four-week treatment phase. Baseline assessments (day 30 +/-10 days) include standard history and clinical assessment, neurocognitive assessment, CHQ, BASC-2, BRIEF and actigraphy. During treatment the participant will keep daily sleep and treatment logs. Actigraphy will continue through treatment. Weekly telephone calls will be made to monitor adverse effects. Post-treatment assessments occur during days 59 to 70 and a final telephone follow-up will occur at day 90 (+/-7 days). CHQ (Child Health Questionnaire), BASC-2 (Behavioral assessment system for children), BRIEF (Behavior Rating Inventory of Executive Function). The study will take place in two academic children’s hospitals in Canada, Alberta Children’s Hospital and Children’s Hospital of Eastern Ontario. The target population will be all children aged between 13 and 18 years with an mTBI who remain symptomatic at 30 days post-injury. Parents and adolescents must provide written informed consent before any study procedures occur. Inclusion and exclusion criteria are shown in Table 2. Post Concussion Syndrome (PCS), Transcranial Magnetic Stimulation (TMS), Magnetic Resonance Imaging (MRI), functional MRI (fMRI). Eligible patients will be randomized in equal proportions between three groups: placebo, 3 mg melatonin and 10 mg melatonin. Medication is taken sublingually at night, one hour before sleep time, for 28 days and will be continued even if there is symptom resolution. The placebo, 3 mg melatonin and 10 mg melatonin sublingual tablets are identically sized white tablets which are peppermint flavored. Administration of the study pill will occur at home under the supervision of the parent. When the study pill is dispensed, the research coordinator will review the importance of following study guidelines and instructions about taking study pills including timing, storage, and what to do in the event of a missed dose. Methodologies to maximize follow-up and compliance include convenient follow-up times, participant engagement strategies (such as newsletters and a website) and experienced research personnel. Adherence assessments will include a review of the medication log, a pill count every week, and a review of reasons for non-compliance. Unused will be counted and recorded on the appropriate case report form. With regards to concomitant care, there are no restrictions on the use of other medications. All participants will be advised to try to avoid analgesia overuse. Participants will be asked to complete a diary of any medications, medical appointments and alternative therapies. The Post-Concussion Symptom Inventory - Parent and Youth (PCSI-P and PCSI-Y). These standardized questionnaires examining 26 symptoms, provide an overall rating of PCS. They have four specific domains: physical, cognitive, emotional and fatigue, and a high level of internal consistency reliability (alpha = 0.92) [140, 141]. A change in PCSI scores allows us to account for baseline variability and gender (timeline: pretreatment, mid-treatment (day 14 to 15) and post-treatment (day 30 to 35) and 90 to 120 days post-injury) . Secondary outcome measures (Table 1) will be collected at baseline and at the end of treatment (day 30 to 35). These will include parent and child rating of functional impairment using the 50-item Child Health Questionnaire (CHQ) [128–131], the Behaviour Assessment System for Children – 2 which is a standardized parent report measure of child behavior, and the Behaviour Rating Inventory of Executive Function (BRIEF) to assess daily executive abilities. Neurocognitive ability (including attention, executive functioning, memory, reaction time and information processing speed will be measured using a computerized test, CNS-Vital Signs . Actigraphy will be used to measure: sleep duration, bed time, sleep time, wake time; longest and shortest sleep time [135–137]. Screening takes place by telephone around 30 days post-injury. Parental consent and youth assent will be obtained by the research assistant in the clinic. The main objective and hypothesis is based on the difference between the placebo and the 3 mg melatonin groups. The outcome of interest is the change in the PCSI score (day 30 minus day 59) and calls for a test of means between groups using one way analysis of variance (ANOVA). We used data obtained in our epidemiological study to calculate a reliable change score using the Jacobson Truax method [10, 143]. A 10-point change on the PCSI-P score indicates a reliable change for subjects who are symptomatic at one month (SD 14.7). Further, we find that in practice a 10-point change is also clinically significant. Using a significance level of alpha = 0.05, expecting a power of 80%, assuming a within group SD of 14.7 and using as an effect size a difference between groups of 10 (the reliable change score), a sample size of 30 per group is required. Allowing for a 10% attrition rate, 33 participants per group are required. Recruitment will occur over three years with 36 to 48 patients being recruited each year. Baseline demographic and clinical variables will be examined for group differences using ANOVA for continuous variables and chi-square tests for categorical variables. Subsequent analyses will involve controlling for possible confounding factors. All analyses will be done on an intention-to-treat basis (last observation carried forward). Group differences in the change in PCSI scores will be analyzed using ANOVA, with placebo, 3 mg melatonin and 10 mg melatonin as groups. Estimates and corresponding 95% confidence intervals for the a priori set pairwise comparisons of interest (placebo versus 3 mg, 3 mg versus 10 mg and/or placebo versus 10 mg) will be provided. Time to symptom resolution (as defined by a PCSI score equal or less than pre-injury) will be examined using the Cox proportional hazards model. Adverse events will be tabulated. Complete documentation will be kept on ‘non-completers’, including their reasons for non-completion. Differences between randomized groups for early termination will be descriptively reported. A secondary efficacy analysis will be done on ‘completers’ per protocol only, excluding protocol violations. Analyses of secondary outcomes will examine group differences with a series of ANOVAs examining changes in scores for: 1) CHQ, 2) BASC-2 (parent), 3) sleep parameters, and 4) cognition (measured by CNS Vital Signs battery: attention, executive functioning, and reaction time, processing speed). Hierarchical multiple-regression modeling will be used to predict symptom improvement by entering sleep parameters (step 1), and treatment group (step 2) in order to determine how predictive treatment is above and beyond any effects of melatonin on sleep. Subgroup analysis will be based on the following dichotomies: personal or family history of migraine, loss of consciousness, and previous history of concussion. Bonferroni correction will be used for post hoc analysis. All analyses will be performed using Statistical Package for the Social Sciences ( SPSS) version 22.0 (SPSS Inc., Chicago, Illinois, United States). Outcome analysis will be performed after all participants have been recruited and reviewed by an independent biostatistician as part of the Data Safety Monitoring Board (DSMB). An interim safety analysis will be performed under the direction of the DSMB. Melatonin is available as an over-the-counter sleep aid in Canada. It is well tolerated by humans even at supra-physiological doses . Systematic reviews of melatonin in sleep disorders have found melatonin to be safe in adults and children [144, 145]. For all adverse events, there was no significant difference between melatonin and the placebo . Any adverse events in PLAYGAME will be immediately reported to the principal investigator who will report any serious unexpected adverse event to the DSMB. The Trial Steering Committee (TSC) in accordance with Good Clinical Practice Guidelines will manage the trial (Chair: KMB). All lead investigators and authors of this paper will be steering committee members. The Trial Management Committee (KMB, BLB, AK, FPM and BT) will be responsible for the day-to-day running of the trial. The DSMB will be responsible for safeguarding the interests of trial participants, potential participants and investigators (JH, LR and RP). KMB (Director of Brain Injury and Rehabilitation Program) is a pediatric neurologist and expert in TBI. She will be responsible for the day-to-day management, adherence to protocol, patient clinical concerns, data interpretation, manuscript preparation and distribution/utilization of trial results. DD is an experienced research team leader and neurobehavioral scientist who, together with MDH, will ensure smooth trial operation, and DJ is an expert in knowledge translation. This research team brings together the expertise of a TBI neuropsychologist BLB (cognitive testing), pediatric emergency medicine MA (ED personnel management, data collection and recruitment), an expert in pediatric sleep disorders and VK (antigraph and sleep logs). Research methodological and biostatistical experience will be provided by SC and ANA (study design, data management and data analysis). It is expected that children treated with melatonin will have lower scores on the PCSI when compared with the placebo, and will have less behavioral (measured using the Behavioral Assessment System for Children) and functional impairment (measured using the Child Health Questionnaire). We expect to observe a dose-response relationship, with 10 mg melatonin treatment group having significantly lower PCSI scores, faster reaction times and increased processing speed compared with the 3 mg melatonin group. Sleep parameters are not expected to differ between the melatonin groups. It is expected that melatonin will be well tolerated without serious adverse side effects. Melatonin is available as an over-the-counter sleep aid in Canada. It is well tolerated even at supra-physiological doses. It has many biological properties that make it a promising treatment in traumatic brain injury. This study is a first step in elucidating whether sublingual melatonin is a useful treatment for children with post-concussion syndrome. This study will provide valuable information about the neurobiology of post-concussion syndrome in children, including the neurophysiological and structural properties of the brain during recovery from mTBI (not discussed here). The trial commenced on 4 December 2013 and is in recruitment. It will run until approximately November 2019. This study is funded by Canadian Institutes of Health Research (grant number: 293375) and Faculty of Medicine, University of Calgary. These funding sources had no role in the design of this study and will not have any role during its execution, analyses, interpretation of the data, or decision to submit results. The design, management, analysis and reporting of the study are entirely independent of any manufacturers of melatonin. Pediatric Emergency Research Teams at Alberta Children’s Hospital and Children’s Hospital of Eastern Ontario, and Pediatric Emergency Research Consortium, Canada. KMB: principal investigator, conception and initiation, running of the trial, writing, critical revision, and final approval of manuscript. DD: conception and design of study. DJ: aided in design of study, emergency medicine, and knowledge translation. AK: conception and design of study, transcranial magnetic stimulation. FPM: conception and design of study, functional neuroimaging. BLB: conception and design of study, neuropsychological testing. AM: design of study, recruitment, emergency medicine. VK: conception and design of study, sleep medicine. MH: conception and design of study, trial operations. ME: conception and design of study, trial operations. BT: Implementation, data collection and trial operations. TS: Implementation, transcranial magnetic stimulation data collection and analyses. RZ: Implementation, data collection. SC: Design and analyses of data. MDH: Design and analyses of data, trial operations. ANA: Design and analyses of data. CAE: Independent advisor to trial. JB: Data management, therapeutics. LR: Data safety monitoring. RP: Data safety monitoring. JH: Data safety monitoring. All authors read and approved the final manuscript.